It took me a little bit longer than I thought it would, but I finally came up with a specific budget and plan for the Guest Bathroom Mini-Makeover. 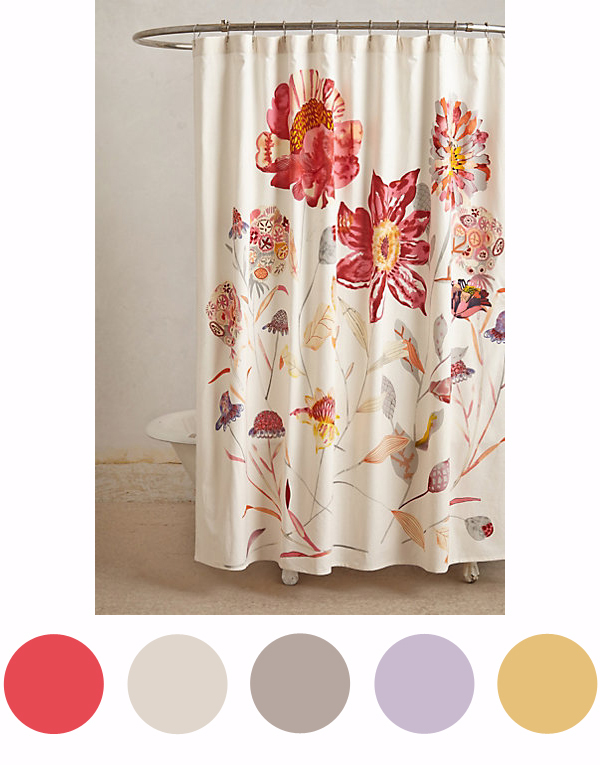 I decided to go with the Anthropologie shower curtain because its color scheme connects well with the adjacent hallway and dining room and because my mother weighed in and said she thought it was the better choice. I went with warm metals for the finishes, but mixed it up by including oil rubbed bronze, antiqued brass and gold. At first, I selected a chrome faucet that I really liked but it just looked too bright and shiny next to everything else. One of the benefits of making a concept board like this is that you can instantly see if one of your choices doesn’t look exactly right. In order to stay under budget, all of my selections are a mix of medium to low. I almost cheaped out on the faucet. There were some really pretty options on Faucets Direct for under $100, but I took the advice I always give my clients and stuck with a reputable brand. I chose the Devonshire from Kohler, which is a solid standby. When something has moving parts and you’re touching it multiple times a day, you want it to hold up. I did consider spending more on the light fixture because I recently fell in love with the Pittock Double Sconce from Rejuvenation and wanted to mount it horizontally, but I couldn’t justify the cost in this room. Maybe in our master someday. I like the warm gold tone of this one from Minka Lavery as well as the frosted shades that point upward instead of straight down, which creates shadows on the face. Plus, it takes three 100 W bulbs, which I can put on a dimmer. I debated more of a vintage style medicine cabinet, but I wanted it to be streamlined and simple with as much reflective surface as possible. I’ve used this cabinet from Kohler in client’s homes, and it’s great because it’s mirrored on the inside with glass shelves. Plus, it’s very well priced in comparison to Nutone or Robern. The tissue holder and towel ring were budget finds at Ballard Designs. The wall hooks and cabinet hardware are from Anthropolgie, and the decorative towels are from World Market. The flooring is peel and stick vinyl tile from Lowes – cheap and easy to install. I found the brass and glass shelf/towel rack at Bellacor. I was originally looking for a train rack style shelf and couldn’t find any I liked that weren’t chrome or had a towel bar as opposed to hooks. I like this shelf option because it’s 22″ wide, so two towels can hang folded side by side, and the glass shelves are nice for holding toiletries for guests. With twelve different finish options, this was a great find for future projects, and I’m interested to see what the quality is like in person. 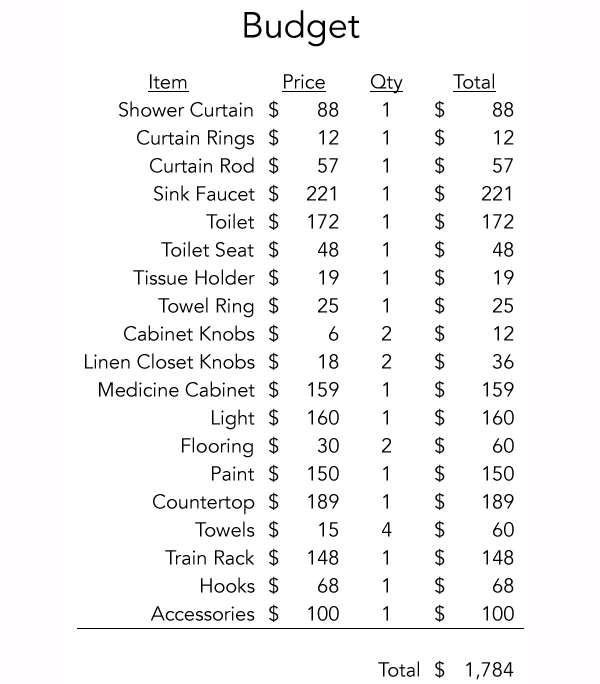 You can see the sink faucet is the single most expensive item, and the toilet comes in a close second. Like I mentioned above, this makes total sense because they are mechanical and are used often. I included $100 for Accessories like bath mats and extra towels and another $150 for paint and supplies. With tax and shipping costs, I should end up right around $2000. This project will be on hold for the next month as I’m traveling back to Pennsylvania, but when I get back in July, I plan for this bathroom to be my first big accomplishment of the summer.